This is a dish with some great fresh and crisp textures. Prepare a salsa, e.g., Fire Roasted Sweet Corn and Avocado Salsa. Marinate the steak for 8+ hours in a marinade of Worcestershire sauce, olive oil, cumin powder, red pepper flakes, and black pepper. Grill steak to medium rare or medium, let stand 5 to 10 minutes, and thinly slice. Prepare crispy torilla strips by cutting corn tortillas into short strips and pan frying in oil. 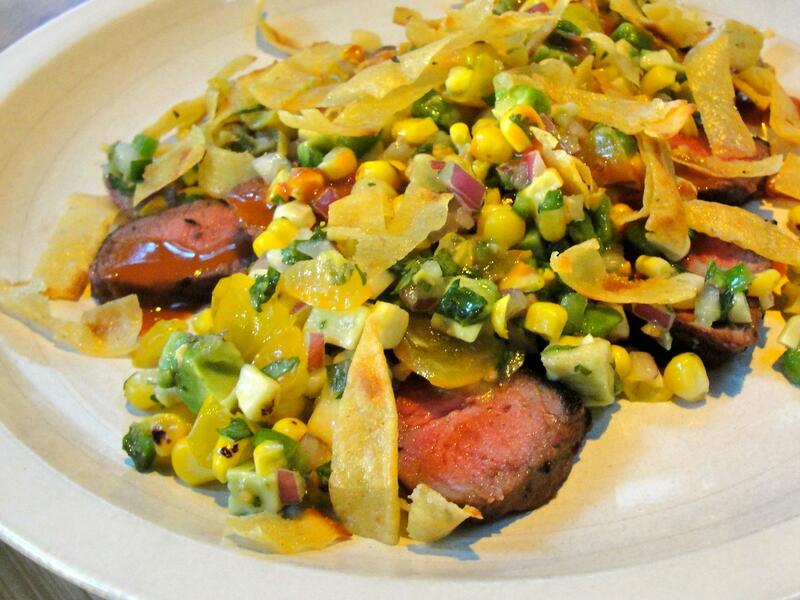 Serve sliced steak topped with corn salsa, perhaps a hot sauce (I used Valentina Salsa Picante), and tortilla strips.